We want to wish you all a very Happy Thanksgiving, and we pray that as the Christmas season unfolds you will all be able to enjoy the celebrations and also help spread the knowledge and love of Jesus to those around you. We are just so very blessed in this country, in spite of the many challenges our nation faces. So often our news is dominated by political arguments over issues that are quite trivial in the whole scope of things, and we tend to forget the reality that so many of our Christian brothers and sisters around the world are facing each day! Pastor Sika in Togo – He told us that they have had to stay home more recently as it is too dangerous to go out into the streets because of huge demonstrations against the government. Armed soldiers are everywhere and it is unwise to go out at night. Thankfully the recent funds we sent were received and passed on to the JP orphanage without any problems, although since it is a four hour journey from Lomé, Pastor Sika has to carefully plan when he can go. We pray things will calm down soon to allow him to visit over Christmas. 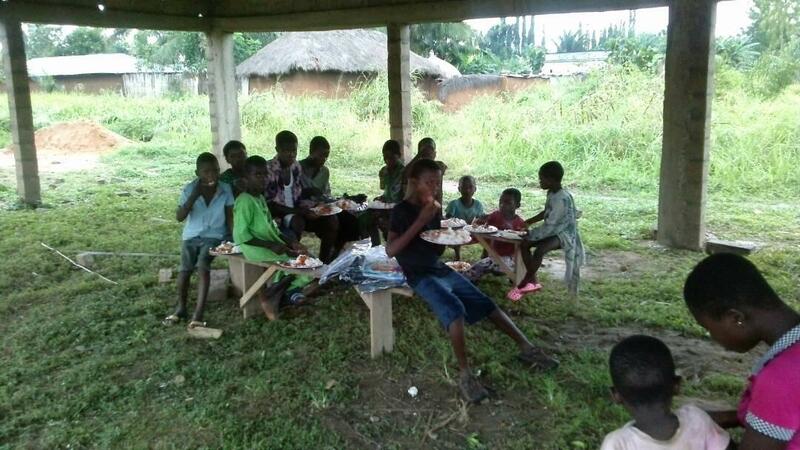 This photo shows some of the children eating under the newly roofed church, which is providing more useful space for both church services and other activities. Pastor Honore in CAR – He and Clarisse recently held a marriage seminar that was very successful, but he has also been battling severe headaches. We are still waiting to hear news of the birth of their new baby. Apparently on Nov. 12th seven people were killed and around 20 others injured in a grenade attack on a peace concert and reprisal violence in Bangui, in two consecutive days. The attack came as the UN Security Council was scheduled to vote to send an extra 900 troops to protect civilians. The UN Secretary-General just visited one of the regions worst affected by the increasing violence, where almost 2,000 people are currently sheltering in a refugee camp in the town of Bangassou, after a dramatic rise in conflict between armed groups in recent months. Safety and security seem to depend on UN peacekeepers, but some of the peacekeepers themselves have been accused of sexually abusing those they have been sent to protect. The UN has said that violence sweeping across the nation has left a record 1.1 million people destitute and homeless. The number of people who have been internally displaced has increased by 50 percent since January 2017. At least 600,000 are internally displaced across the country, while another 500,000 have fled across the border to neighboring countries. Mike in Kenya – He has been busy with regular activities such as the mobile clinic, local church and school ministry (as seen in the first photo above); but he will be VERY busy throughout December. He will be helping with a large youth conference in the city of Nakuru (as seen in this poster) and also organizing the annual children’s camps sponsored by the Kenyan Assembly of God. We pray for strength and wisdom for him as he deals with so much responsibility and work for the Lord. ← Joy with Jesus teaching – God said do WHAT?? ?